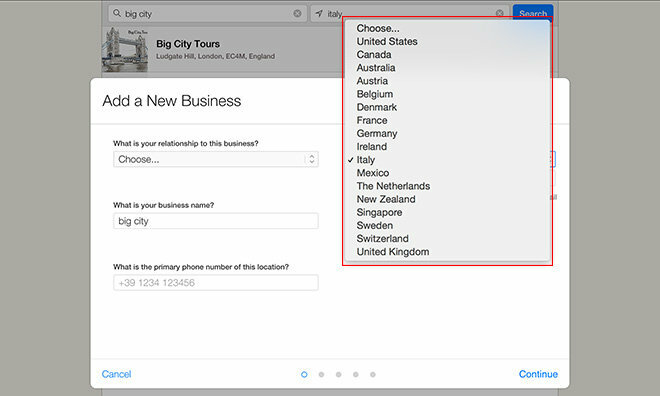 As seen on the Apple Maps Connect Web tool, five new countries —Austria, Belgium, Denmark, the Netherlands, Sweden —are now accessible under the "Add New Business" option, allowing small business owners to add their listings to Apple's Maps database. Apple debuted Maps Connect last October in a bid to build out its POI database without going through third-party business listing aggregation firms. At launch, the service was limited to U.S. users, but has since expanded internationally and now incorporates listings from Australia, Canada, France, Germany, Italy, Ireland, Mexico, New Zealand, Singapore, Switzerland and the UK. The search tool lets business owners scan Apple's database for known listings. If their business is found, they can apply for ownership of the Maps property and, after a quick fact check from Apple, make edits to the listing. Owners can also register for integration, though Apple is currently limiting submissions to companies with 1,000 or more locations. Since a shaky introduction in iOS 6, Apple has been working to build out Maps as a legitimate competitor to rival services like Google Maps. Most recently, vans loaded with advanced surveying equipment are being spotted across the U.S., potentially hinting at a secret 3D mapping initiative that could go up against Google's Street View.